Significant stenosis of the mitral valve will almost always be recognized and treated during early childhood, though milder forms of the disease may not be diagnosed until later in life. Frequently, mitral stenosis occurs with other congenital heart defects, such as coarctation of the aorta, aortic stenosis, or other abnormalities of the aortic valve. This defect is diagnosed and evaluated by echocardiography. These allow the physician to study the anatomy and severity of the defect and to devise its treatment. In some cases, a cardiac catheterization procedure will be necessary to take hemodynamic measurements (blood pressures and concentrations of oxygen and other gases) inside the heart. Medications such as beta-blockers, antibiotics, diuretics, and/or anticoagulants (e.g. warfarin) may be prescribed to reduce pressures in the left atrium and to combat symptoms of arrhythmia and associated blood clots (embolisms) or inflammation of the interior lining of the heart (bacterial endocarditis). If severe symptoms of obstruction are observed, then surgical treatment or cardiac catheterization may be necessary. 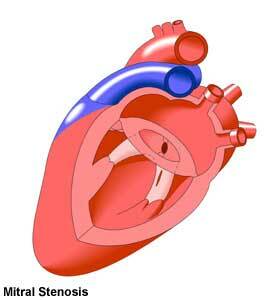 The most common surgical procedure is the replacement of the mitral valve. In some cases, a cardiac catheterization and balloon valvuloplasty, in which a balloon is used to enlarge the constricted mitral valve, may be performed.